Michael David Cabinetry and Design, LLC specializes in you and your company’s specific woodworking needs. Whether it’s a custom showroom display designed to showcase your products in a unique and professional manner or a custom cabinet system for an employee break room or a conference / meeting room, Michael David Cabinet and Design, LLC will bring its years of expertise in design and craftsmanship to work for you. We can and will deliver. High quality custom commercial furniture built beautifully and to last much like your home, it is important to create a space that is warm and inviting while is maintaining professionalism. 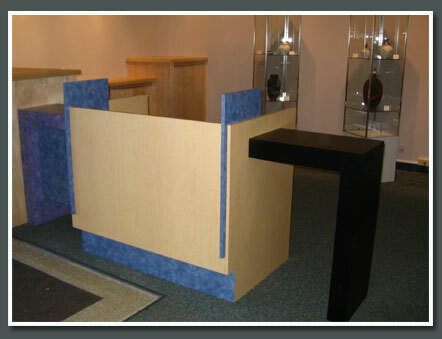 A high quality custom made piece can really set the environment for employees and customers. We have had the privilege to work with a variety of business and schools to create custom desks, lockers, showroom displays storage and so much more.